I’m probably more obsessed with ED books than is healthy, but it’s so reassuring to read other people’s experiences that are similar to my own. This book was absolutely fantastic – not only did it help me see that I’m not alone or abnormal, but I was also able to read a mother’s point of view on the experience. I understand now how awful it must have been for my own mother during my inpatient hospital stay and the initial battle of getting a diagnosis. I found it interesting that they gave Jo (the mother)’s perspective first, instead of Alice herself. 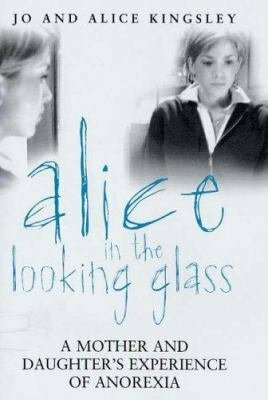 We learn about what she witnesses before we find out exactly what Alice was actually thinking and feeling. They don’t include weights or numbers in this, which is tremendously helpful. Like Jo says, this is a competitive illness, and even parents seem to want to compete in having the “most poorly” child. But it’s so triggering for other people to read about how much weight someone lost, and it’s not really relevant. Weight loss is just a side affect of the illness, and not the main issue itself. The reality is addressed so honestly in this book, all the feelings and experiences that we may be ashamed to admit are written in black and white. It made me feel a lot less guilty about things that I’ve felt, knowing other people have felt the same way, too. And the recovery aspect was not unrealistically easy or happy; Alice is not completely recovered even at the end of the book, but is managing her illness. That is how most of us will live for a long time, if not for the rest of our lives. But Alice expresses how she is so much happier “managing” her anorexia than she was when she was suffering years ago. It gives hope – even if you don’t fully recover, life can be good. I really loved this book. I’d urge anyone with a loved one who is suffering from an eating disorder (or has one themselves) to read this, as it would really help seeing both perspectives on the journey. 5 stars. This is a really useful guide for anyone trying to decide how to get into comics/graphic novels, or what to buy/read next. It provides a synopsis, review quotes and images from 25 of the most “essential” novels from DC to date, as well as a suggested reading order for Batman, Superman, Wonder Woman, Suicide Squad, Flash, Robin and more. Some of the most important graphic novels, according to this guide, include Watchmen, Batman: The Killing Joke, The Sandman, V for Vendetta, Gotham Academy and Flashpoint. Of course, there are 19 more novels listed, too. The guide includes stand alone novels, and Vertigo novels. There is a section dedicated to comics inspiring and inspired by TV shows or films, such as iZombie (a personal favourite that I’m dying to read). As well as a backlist for every DC and Vertigo graphic novel, the guide includes a selection of different collectables available. Everything listed in this book has an RRP included, and the ISBN (and lots of other details) to make it easy for anyone to find and buy. The authors and artists are all credited, too. The layout of the suggested reading order pages could’ve been a bit clearer, I feel, but I think this guide served its purpose pretty well. 3.5 stars. My psychology teacher recommended this book at the start of the year, and as it’s about the field of work I’m hoping to go into I thought I’d read it. It did take me quite a while to finish, but I still really enjoyed reading it. Paul Britton, a successful forensic/criminal psychologist, goes into detail on some of the most horrific cases the UK has seen. He discusses his role in the House of Horrors, the contamination of Heinz products, and the abduction of a newborn baby, as well as countless other murders and rapes. As well as his psychological profiles, Britton talks about his personal experience with working with the police, and how his personal life was affected. He also mentions his NHS career in psychology. Because this is my ideal career, I found this all very fascinating. It definitely isn’t a book for the fainthearted, though – Britton’s descriptions of crime scenes and offences are brutally honest and vivid, and I was honestly so shocked by the cases he worked on. As Britton says, it really does make you see the world in a whole different light when you’re aware of offenders walking the streets right now. This was really interesting and gave a lot of insight into the life and career of Paul Britton. It didn’t glamorise the career or the offences committed. 4 stars. This isn’t really a graphic novel, but kind of an illustrated memoir. It is not a fictional story with magic or monsters; instead, it discusses so many different aspects of life, growing up in different places during different times, and being a family. There are several key themes and events in this novel. One huge factor is war; how it affected the family and their life together. There’s also a lot about what it means to be family, what motherhood is and what childhood is, and also the loss of a loved one. Another massively important theme is immigration; Bui describes being a refugee, illegally sailing away from Vietnam after they surrendered, and trying to build a life as a family in a whole new country. So many people are ignorant of these issues and hardships, not realising how much some families go through just to taste happiness. The colour scheme is rather clear – oranges and blues, mostly. It has a very watercolour-y effect, giving a sense of remembrance and recollection of the past. The art is really lovely in this – I feel it portrays the story fantastically, and is just beautiful to look at on its own. I found it really interesting how Thi Bui focused so much on the lives of her parents before they met, emphasising how even parents are people with their own lives and pasts and problems. As she becomes a parent herself, she realises how her mother must have felt for all these years. As someone with a pretty “boring” life, I was also really intrigued by the journey everyone in this book made. The migration to America, trying to build a life and earn money and keep safe – it was a pretty emotional journey! But Bui never dwells on these negatives, never moans or wishes for change. She just says everything as it is, which I really admire. This is a really interesting read for anyone who likes history, learning about different cultures, or just wants to appreciate their family more. It discusses some huge issues – miscarriage, infant fatalities, immigration, war – that a lot of people could benefit from reading about. And the art is wonderful! 4 stars for this novel. If you’re interested in this book, it’s available now on Amazon. At school a little while ago we looked at an extract from this book, and I decided I may as well read the rest of the book too. If you don’t already know, Joe Simpson suffered a serious leg injury while climbing a previously unreached summit in the Peruvian Andes, 1985. His partner, Simon Yates, had a life-changing decision to make that would determine who would live and who would not. Joe tells his story in excruciating detail, with snippets from his partner’s point of view, too. He uses a lot of technical language as would be expected, which can sometimes go straight over the reader’s head. He describes his emotions, his physical pain after the injury, and the setting that he found himself in. Things go well at first, but during the descent there is serious trouble. Joe and Simon work together to lower Joe with his disformed leg, and it works for some time. But eventually, Simon has to decide whether to cut the rope or not. After his first injury, Joe manages to survive an unbelievably long fall. But now he’s stuck in the crevasse, alone, with no hopes of returning to camp alive. Meanwhile, Simon is having to overcome his guilt and travel alone, with several frostbitten fingers and no food or water. The journey that both men must take is truly amazing and although you know the general outcome, you find yourself reading on and on to see what happens next. Although it seems like a pretty short book, it took me slightly longer than expected to finish it. The technicalities meant nothing to me most of the time, making it slightly hard to visualise the scene in detail. But I was still able to appreciate the difficulties and obstacles that the climbers had to overcome, and I am amazed at how they did it. The photos included throughout the book (below) were really helpful for scene-setting, and show how stunning the views were over the mountain range. I don’t read biographies that often, so I knew it wouldn’t be my favourite book. But it was good, and if you like this sort of thing then I would definitely recommend it. 3.5 stars I think. My teacher gave me a small stack of books to read upon hearing how much I love reading, and claimed that this was her all-time favourite. Honestly, the title is what really appealed to me – clearly, it wasn’t anything to do with Breakfast at Tiffany’s, but I appreciated the reference. This novel, this memoir, is a truthful, brutally honest book about life. I can’t say I know what it’s like to be in the author’s place – I’m not a man, I’m not gay, I am not the guardian of my niece and I don’t even live in America – but the little things are just so real. Tiffany’s home life isn’t great, and one day her uncle volunteers to take her in. Never did he anticipate so much drama and pain from such a small girl. She’s thirteen when she first moves in with her Uncle Eddy, and despite being a nice girl she is known to hang around with the wrong crowd. No matter how hard he tries, Eddy cannot prevent her from finding similar friends at her new school. The pair really go through their ups and downs, and Ed himself talks a lot about personal thoughts and issues. He’d tested HIV-positive many years ago, and was also an unsuccessful actor. He broke up with his boyfriend relatively recently, and suffers from obsessive compulsive disorder. Basically, life just has not turned out the way he’d planned. Living with a teenager teaches him a lot of things. He is reminded of his own youth, and has to get on with his life all while keeping Tiffany going too. It’s not easy. Things do get rough, and he does find himself wondering why he ever got himself into this. But in the end their relationship is good, and they have a lot of fun together. 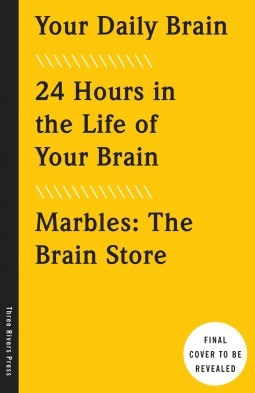 I did find this book great. It has hints of humour, conveys the bitter truth, and even gave me a taste of what it’s like to be a guardian of a teenage girl. There are definitely references I would have appreciated more had I been older than sixteen, and many of Ed’s problems, thoughts or situations may have been more interesting or important to an older generation. That being said, I actually kind of loved this book. It isn’t quite in my favourites – but who knows, maybe in thirty years time it will be. I think I can easily give Breakfast with Tiffany: An Uncle’s Memoir 4.5 stars out of the full five. Two of my favourite things combined together: YouTube and reading! The Amazing Book Is Not On Fire is just jam-packed with everything a fan could want. Stories, photos, illustrations, quizzes, trivia… There is so much going on! As well as all their personal memories and journals, Dan and Phil talk about how they began their YouTube careers, and give advice to those wanting to go into the same profession. There’s even a handy generator for video ideas! All out favourite characters are mentioned, with Jessica, Becky, Dil Howlter, Simon the shrimp and Phil’s lion having their own pages. Oh, and a double-page spread of Phil’s hamster-breeding experiences. And yes, there is fan-fiction. Phil Lester’s tale, The Hand, features Harry Styles in a rather unexpected manner… And Dan’s The Urge is, unsurprisingly, rather strange and dark. They are surprisingly nice reads in themselves! Everything sounds as if the boys are reading aloud to you, as they’ve managed to capture their own voices in text. It’s honestly just like watching one of their videos! There are deep moments, weird moments, helpful moments, funny moments. I would definitely recommend that any fans of AmazingPhil and Danisnotonfire read this! I’m going to give it 4 stars, as I really enjoyed it! I don’t usually read non-fiction books, but I’m a science geek at heart and couldn’t resist requesting a copy of this in return for my honest review. It was definitely an interesting read. I loved the humour within the writing, and the combination of complicated scientific terms along with more simplified ones. It was easy to understand for the most part, and I hope I can truthfully say that I’ve learned something over the past two days from reading this. Due to my habit of reading books at the speed of light, I don’t think the information in this book has sunk in as much as it could have. I personally found it a little hard to follow sometimes, though it was definitely better than skimming a textbook. This is aimed at an older audience in my opinion, but I was still fascinated by what I read. A lot of it was information that I’d never even considered learning. The effect having a child has on a man’s brain? I can honestly say that it has never crossed my mind. I did enjoy this book, even though I sped through it and am probably a little too young to fully appreciate some of the references. 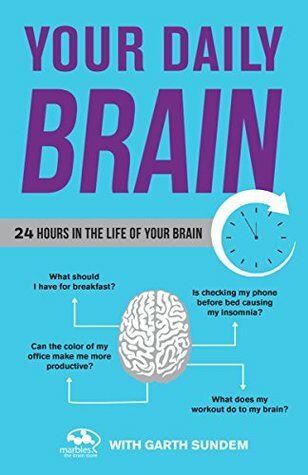 I’d say Your Daily Brain deserves a strong 3.5 stars, maybe edging up near 4.